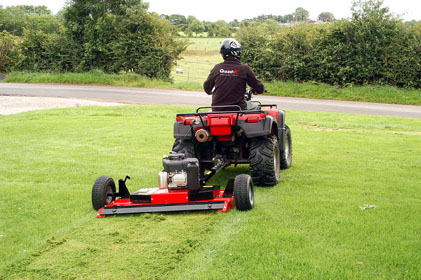 Quad-X manufactures a range of mowers to tackle a massive variety of duties from lawn finishing to pasture topping and pulverising heavy vegetation. The Quad-X ATV compact rotary mower has been designed with twin blades give a lawn finish, yet it is capable of light topping also. 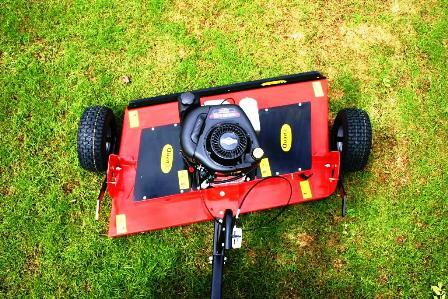 The Compact Rotary Mower comes with a choice of 12.5hp (recoil) or 13.5 (elec start) Briggs & Stratton engine. A mulching kit is fitted as standard to give an even finer-cut finish. The Compact Rotary Mower deck has been specially designed to makes it more manoeuvrable. With the outside corner positioned further back than on a square deck, you can drive closer to trees before having to turn out. Offset wheels allow the ATV mower to get around obstacles, such as shrubs and flower beds more easily. With 1 wheel set further forward on one side than the other, a tighter turning circle means less strimming has to be done around objects. 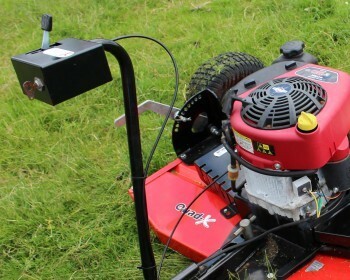 Our research determined that quad lawnmowers are often used in large landscaped gardens with flower beds/shrubs, so the Quad-X compact rotary mower gives a tidier edge finish and is less time consuming. Special Shaped Desk for a tighter turning circle around trees! The height adjustment setting from 19mm-180mm ensures that you can get a tight lawn finish yet can use the mower for light topping. The Quad-X compact rotary mower offers the unique feature of an offset drawbar with top link height adjustment. This top link offers infinite height adjustment to ensure the deck is at the correct level. This can be adjusted each time the deck height is changed to avoid the front of the mower dropping down low and causing the blades to hit the ground. This is essential to give a quality finish. The compact rotary mower has a control box console mounted on the machine which can be reached from seated on the ATV, giving you control over blade speed. 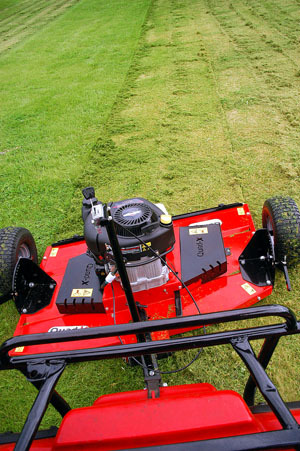 The machine can be turned on/off and blades can be engaged using controls mounted on the deck.